She loves it and what a difference in her health, she is no longer sick, no more upset tummies and she loves meal times. I just wanted to write and tell you the story of my GSD in the hope that it will help other people. Chelsea is 5 years old and I have had her since she was 8 weeks old and my poor dog has suffered with vomiting, upset tummy and not wanting to eat her food more or less from about 16 weeks old. I tried every combination of food possible and the only food she could almost tolerate was Hills Prescription food Z/D Ultra, but even with this she would still vomit at least once a week in the morning and her stools were still very soft. I knew something wasn’t right and my vet still recommended either Z/D or chicken and rice, but chicken and rice made her really poorly, so Z/D it was even though she wouldn’t always eat it and was never very excited about meal times. 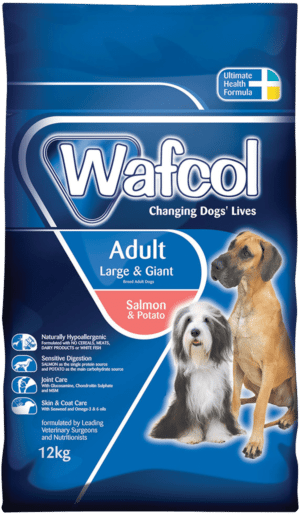 Then I tried Wafcol and wow what a change in Chelsea, she likes it softened with warm water, but she loves it and what a difference in her health, she is no longer sick, no more upset tummies and she loves meal times. I do add a small amount of Natures Harvest Ocean Fish wet food and she has always had wet and dry food mixed and both really agree with her. I can’t recommend Wafcol Salmon and Potato enough and as I have now discovered Chelsea is completely meat intolerant, so she is now a very happy and healthy dog. I have attached a picture of my beautiful Chelsea and you can see what a very healthy dog she is.